I ain’t really got nuttin’ fer ya. You see, it’s “Finding the Funny” day, so I like to pop up in the blogosphere on Wednesdays to be a part of that mess. I usually try to think of something creative to put in this spot above “Finding the Funny”, but, you see, my mind is full. My mind is full of pictures of houses, prices of houses, square feet of houses, whether or not said house has a detached garage, whether or not the seller of the house has a clean shower, whether or not said house includes this, that and ‘tother. We have been looking and looking for a house. We have come so very, very close to getting some, but it seems every house we like, someone else likes it and gets it before we do. I want a house already. An aprium? 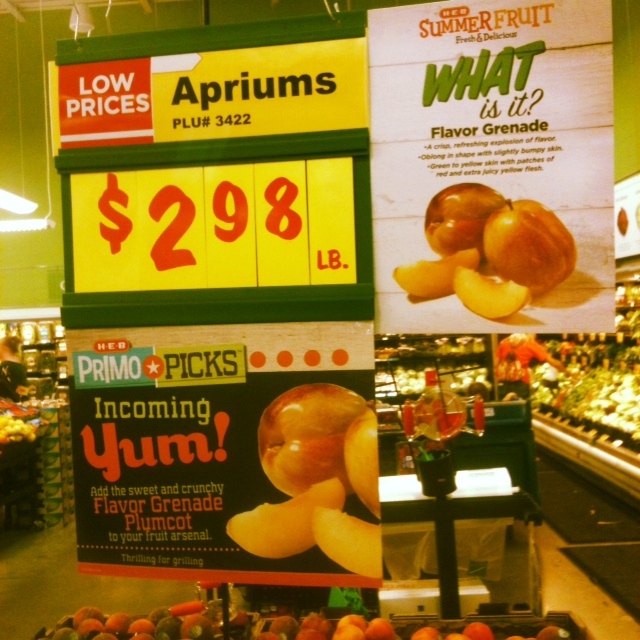 A PLUMCOT?! I tell you what, if I hear of an apnana, I’m gonna make a scene right in the produce aisle! *I’ll show them a flavor grenade, if you know what I mean, and I know you don’t because that sentence made no sense but I decided to keep it in there because it made me sound edgy and don’t you hate run-on sentences like this one? Your posts will appear here and at Anna’s place.